There is a numeric keypad on the DT402/DT400 throttle. 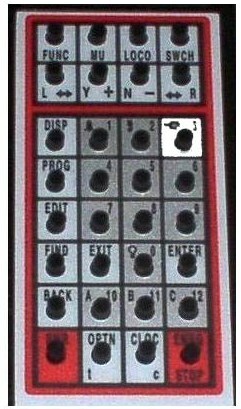 The numeric keys on the keypad are primarily related to the throttle mode shown in the LCD’s mode indicator area, but can be used for numeric entry and function control in other modes. 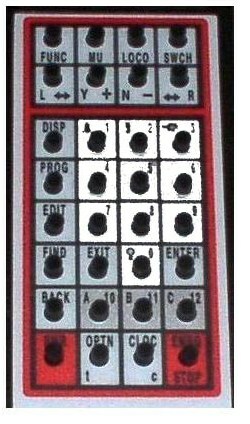 For example, when the command station is in the Function Mode Fn, the numeric keys are used for function control. 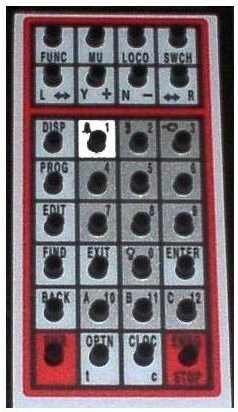 When the command station is in the Locomotive Mode,Lo, the numeric keys are used to enter loco addresses. When the command station is in the Switch Mode is Sw, the numeric keys are used to enter switch addresses. These additional keys, A10, B11 & C12 make it easy to use functions 10-12 and give more flexibility for future features by providing A, B & C as possibilities. The 0-12 Keys allow direct entry of loco and switch addresses as well as CV values during selection and programming. These keys can also give direct access to functions 0-12 during normal operation of locos. The Lamp / 0 Key is most often used to turn on and off the locomotive's head lights. It can also be used for other functions as desired. 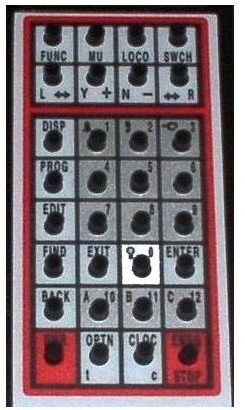 The Bell / 1 Key is most often used to turn on and off the bell sound in locos equipped with sound decoders. The Horn / 2 Key is most often used to turn on and off the horn sound in locos equipped with sound decoders. This function key is a momentary key that will activate the sound as long as the key is held down. Please see the related article about playable whistles. 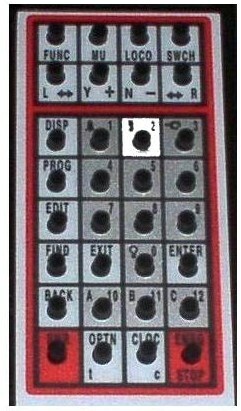 The Coupler 3 Key is most often used to activate couplers. It can be programmed to operate any function. Note: The DT402/DT400 can access F0-F12 when used with DCS50 or DCS100 Command Stations. 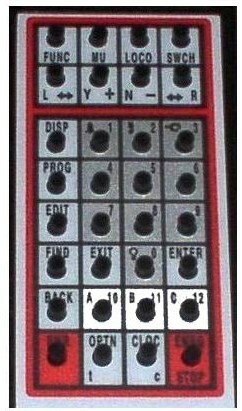 DT400 can access F0-F8 when used with DB150 Command Station.